﻿ GAO Reports Weaknesses In Determining Foreign Flight Students Status In The U.S.
July 19, 2012 - The U.S. Government Accountability Office (GAO) which is an independent, nonpartisan agency that works for Congress, often called the "congressional watchdog," has conducted a study in which the GAO has determined that there are cases in which foreign flight students entering through TSA’s Alien Flight Student Program (AFSP), are in this country illegally. A vetting process has been set up since 911 to prevent this from happening however GAO has reported there are flaws in the program. The Transportation Security Administration (TSA) and aircraft operators have taken several important actions to enhance general aviation security, and TSA is gathering input from operators to develop additional requirements. For example, TSA requires that certain general aviation aircraft operators implement security programs. Aircraft operators under these programs must, among other things, develop and maintain TSA-approved security programs. TSA has also conducted outreach to the general aviation community to establish a cooperative relationship with general aviation stakeholders. In 2008, TSA developed a proposed rule that would have imposed security requirements on all aircraft over 12,500 pounds, including large aircraft that Department of Homeland Security (DHS) analysis has shown could cause significant damage in an attack. In response to industry concerns about the proposed rule’s costs and security benefits, TSA is developing a new proposed rule. Officials from all six industry associations GOA spoke with stated that TSA has reached out to gather industry’s input, and three of the six associations stated that TSA has improved its efforts to gather input since the 2008 notice of proposed rulemaking. TSA vets foreign flight student applicants through its Alien Flight Student Program (AFSP), but weaknesses exist in the vetting process and in DHS’s process for identifying flight students who may be in the country illegally. From January 2006 through September 2011, more than 25,000 foreign nationals had applied for Federal Aviation Administration (FAA) airman certificates (pilot’s licenses), indicating they had completed flight training. However, TSA computerized matching of FAA data determined that some known number of foreign nationals did not match with those in TSA’s database, raising questions as to whether they had been vetted. In addition, AFSP is not designed to determine whether a foreign flight student entered the country legally; thus, a foreign national can be approved for training through AFSP after entering the country illegally. 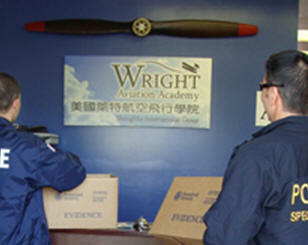 A March 2010 U.S. Immigration and Customs Enforcement (ICE) flight school investigation led to the arrest of six such foreign nationals, including one who had a commercial pilot’s license. As a result, TSA and ICE jointly worked on vetting names of foreign students against immigration databases, but have not specified desired outcomes and time frames, or assigned individuals with responsibility for fully instituting the program. Having a road map, with steps and time frames, and assigning individuals the responsibility for fully instituting a pilot program could help TSA and ICE better identify and prevent potential risk. The sensitive security version of this report discussed additional information related to TSA’s vetting process for foreign nationals seeking flight training. (2) TSA efforts to ensure foreign flight students do not pose a security threat. GAO reviewed TSA analysis comparing FAA data from January 2006 to September 2011 on foreign nationals applying for airman certificates with AFSP data, and interviewed 22 general aviation operators at eight airports selected to reflect geographic diversity and variations in types of operators. This is a public version of a sensitive security report GAO issued in June 2012. Information TSA deemed sensitive has been omitted, including two recommendations on TSA’s vetting of foreign nationals. GAO recommends that TSA identify how often and why foreign nationals are not vetted under AFSP and develop a plan for assessing the results of efforts to identify AFSP-approved foreign flight students who entered the country illegally. DHS concurred with GAO’s recommendations and indicated actions it is taking in response. To better ensure that TSA is able to develop effective and efficient security programs for general aviation operators, the Administrator of TSA should take steps to identify any instances where foreign nationals receive FAA airman certificates (pilot’s licenses) without first undergoing a TSA security threat assessment and examine those instances so that TSA can identify the reasons for these occurrences and strengthen controls to prevent future occurrences. To better ensure that TSA is able to identify foreign nationals with immigration violations who may be applying to the Alien Flight Student Program, the Secretary of Homeland Security should direct the Administrator of TSA and the Director of ICE to collaborate to develop a plan, with time frames, and assign individuals with responsibility and accountability for assessing the results of a pilot program to check TSA AFSP data against information DHS has on applicants’ admissibility status to help detect and identify violations, such as overstays and entries without inspection, by foreign flight students, and institute that pilot program if it is found to be effective. Agency Affected: Department of Homeland Security: Transportation Security Administration.